In Part II of High Availability with SQL Server and Double-Take, we discussed how to configure and test a typical failover scenario using Double-Take. At this point, you should now be able to create a replication set and configure replication and mirroring. In the final article of this series, we will show you how to restore your SQL Server data once a failover has occurred. In this blog, we will assume that you are running two production SQL Servers with Double-Take software loaded for High Availability and Disaster Recovery. At some point during the night, you had either a network outage, power outage, disk failure, and/or a combination of problems. The Double-Take software failed over to your Target SQL Server and you had no downtime. You were paged last night about the failover and you made sure Double-Take was performing as promised. Everything was working soundly so you slept easily, or not, and were prepared to bring the Source server back online in the morning. Your first step is to make sure that your original source server is not connected to the network. Once you have disconnected it from the network, resolve the issue that caused the problem. Once the issue is resolved, you are ready to restore your SQL Server data. Now that your issue is resolved, please make sure the following services are shut down on the source server: DTC, MSSQLSERVER, SQLSERVERAGENT, and Message Queuing. Now, select Start | Programs | Double-Take |Failover Control, as shown in Figure A., on the target machine that is acting on behalf of the failed source server. Now, select the failed source, as shown in Figure A, and click Failback. The prefailback script discussed in High Availability with SQL Server 2000 failover and Double-Take-Part II stops the applicable services so no additional changes can be made. Next, you will be prompted if you want to continue monitoring as shown in Figure B. Leave this dialog box open and we will choose the appropriate option later in the process. Now you are ready to restore the data and your first step is to connect the original source server back to the network and test connectivity. Next, open the Double-Take Management console from the Start Menu (Start | Programs | Double-Take, Management Console) and highlight the source machine to make sure the replication set is disconnected. Simply right-click on the replication set and choose disconnect. 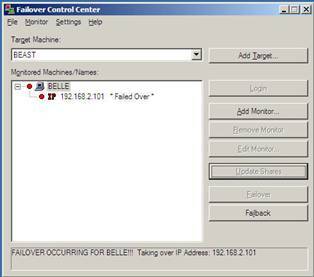 In order to start the restoration process, choose Tools | Restoration Manager from the Double-Take Management Console as shown in Figure C.
On this window, the process is as follows: Place the original source server name prior to the failover in the Original Source text box. Next, click the dropdown and select the name of the server you want to Restore From. This will be the target machine that took over for the failed source. Now, choose your Replication Set name and then choose the name of the machine where the data will be restored. Once you have entered the appropriate information, click Restore. Note: The time required for the restore depends on the size of data being transferred. 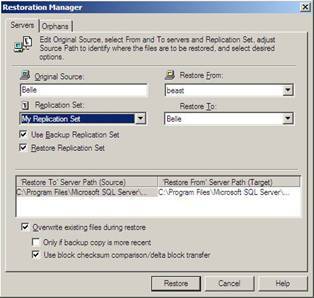 When your restoration is complete, restart the SQL Services on your source machine and reestablish your replication set. Finally, your data has now been restored and you have successfully restored your data back to your original source machine. Note: Remember to click Continue now as shown in Figure B to reestablish your Failover Monitoring.